Blood and Skulls Industry Tracks on a Land Raider - A tutorial! So in building my Ultramarines 30k army, I decided that I wanted some Land Raider for it. However, here's the catch. 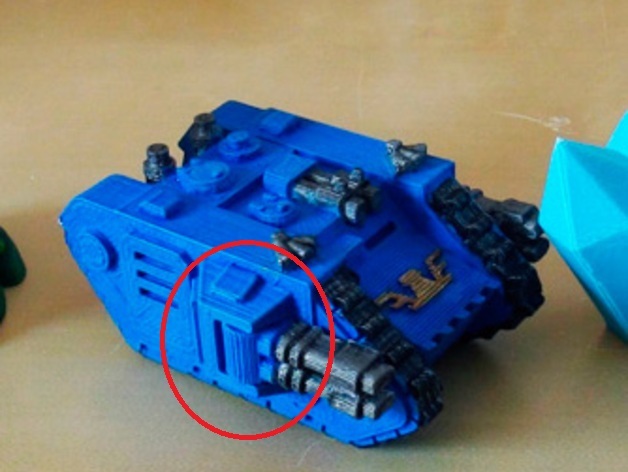 I didn't want them too look like the 40k era MkIIIb Landraiders. Namely, I needed to get the tracks to look like the ones from the OTHER 30k FW vehicles I have for the army, which consist of 2 Land Raider Spartans, a Land Raider Proteus (MkIb), and a Sicaran. I have also been eyeballing some AWESOME tracks from Blood and Skull Industries, a one man shop manufacturer of quality resin conversion parts. Machinator runs an fully stocked Ebay store, which you can get to off of his Facebook page. 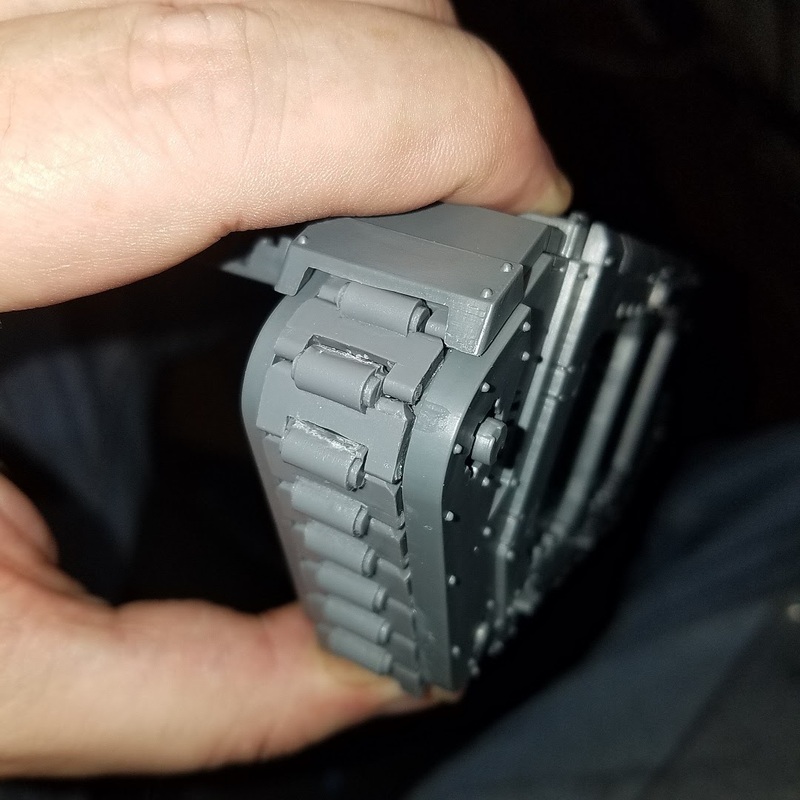 I picked up four of the Liberator 0 track kits. You need 2 for each Land Raider and I am building 2. The quality is great on these, and the detail level is amazing. 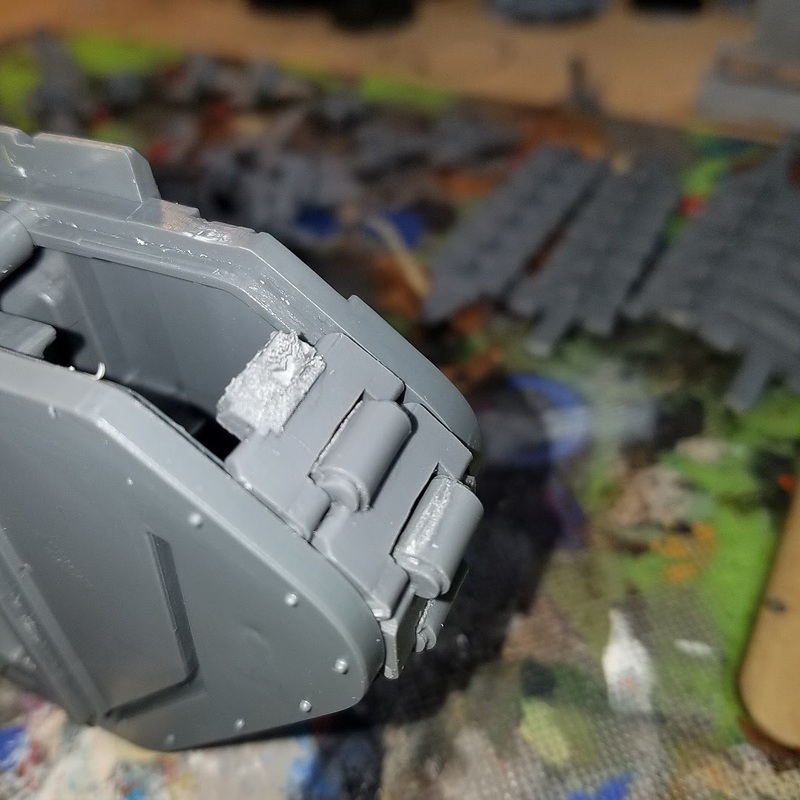 They are molded from some really nice hard resin - well at least harder than GW or Forge World Resin. So first, I assembled the sides of the Raider. 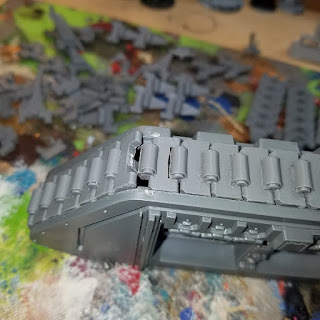 I made sure that they were nice and tight, and started dry fitting the tracks. I used a long link section to start and worked to dry fit them in. I noticed that the side rivets on the tracks would not clear the channels for the tracks, so I had to shave them off. In the channels, there are locator nubs that have to be taken out. I cut these out and then filed the areas flat. 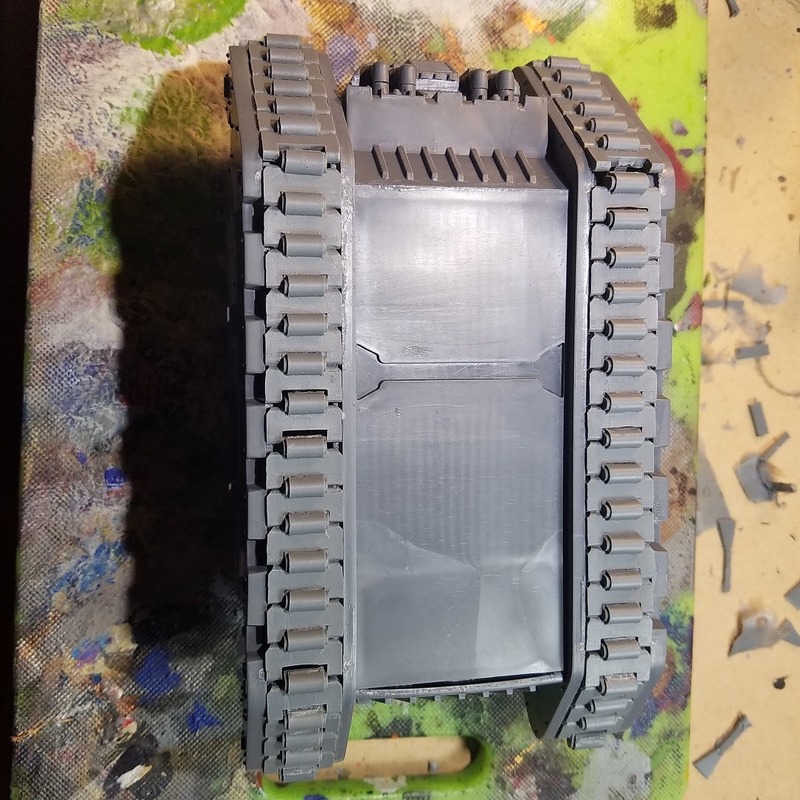 I then started on the front facing area, sliding the 6 link section down until the track "face" was even with the little lip in the channel. I lined up the single link and ran it on the front. 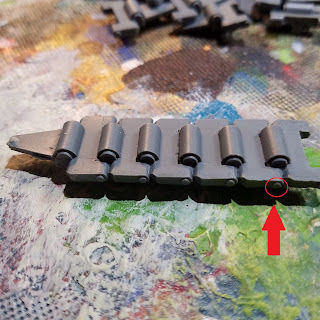 There are only the single and 6 links, and hind sight being what it is, I probably could have cut some really thin plasticard stips and mounted the 3 links going down and back to them, however, I had to push them around a bit to get them all lined up. I worked from front to back, gluing as I went......OOPS. First GOTCHA! 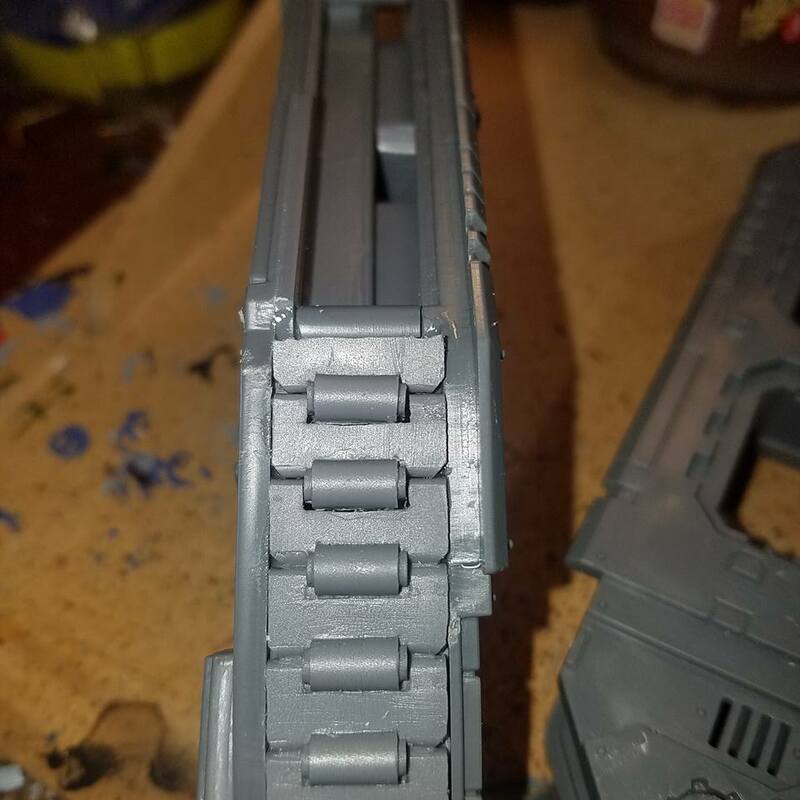 I should have left spacing into the middle of the section to allow me to better align the end to the up moving portion. It's hardly noticeable, and is on the back. Now I know for the other side. 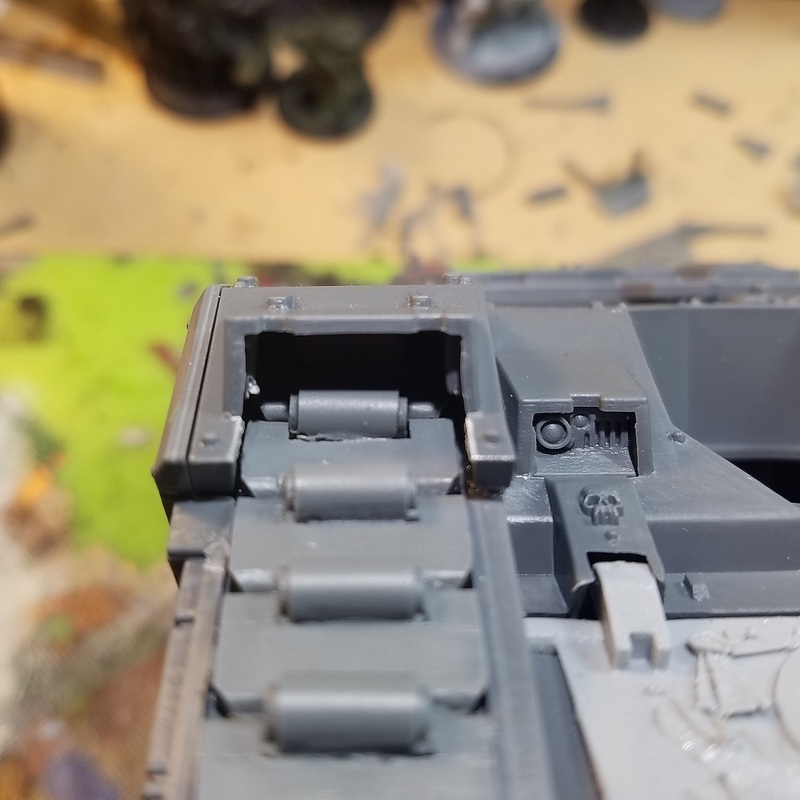 I wrapped them all the way up the back, and then did a dry fit of the track skirts.....the hinge piece under the skirt would push it up a bunch, so I cut it off. After that, it seated nicely. I went ahead at this time, and started working on the other side. 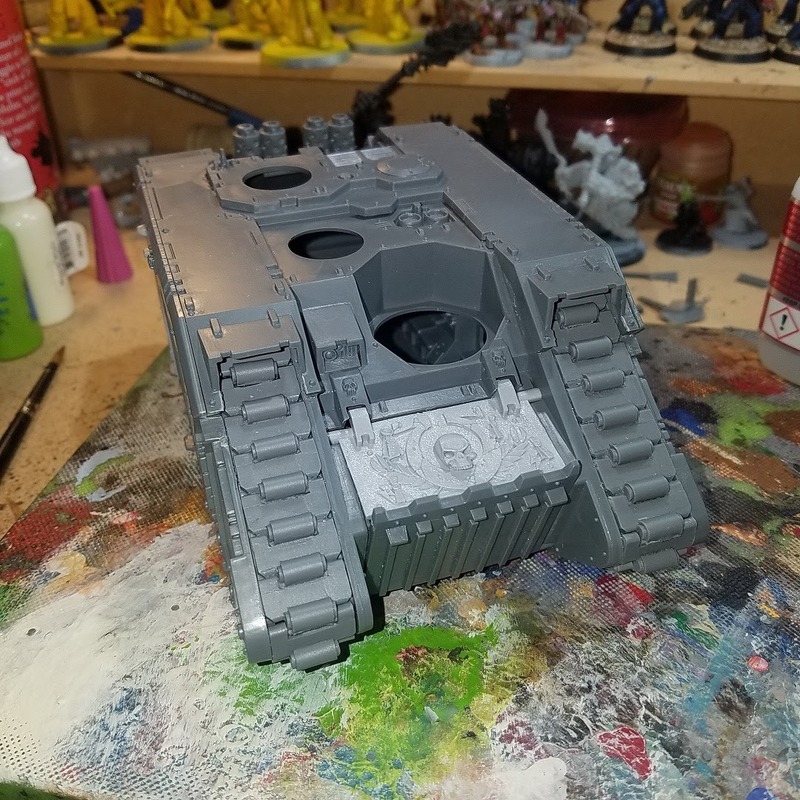 Once done, I started looking at the front. I normally forget those danged headlights. 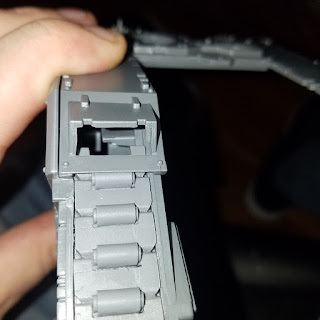 So I decided to cut the bars on the skirts below them and run the tracks all the way up as far as I could get. I as able to get another 1.5 links in. Unfortunately, it was late, and I did not get a picture. However, here is what I cut from the last link to get them to fit. On the back side of the track link, I cut off the drive tooth. I set the full link into place, and then laid this one down behind it. 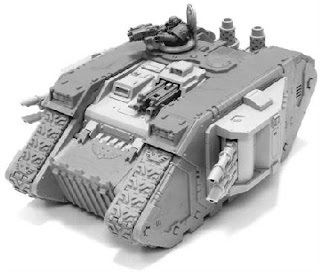 And from the front, with Forgeworld UM Front door. Next step on these Land Raiders - a set of Dual Weapon Sponsons Beta with 2 sets of Light Laser Cannons for each tank. This will get me pretty close to this setup. Machinator makes all sorts of tracks, turrets, weapons, conversion kits. I highly recommend you check him out. Okay, so we sold off my wife's Dark Angels last year, and she has been without an army for a while. When the new models came out for Magnus's boys, my wife made the declaration that she wanted those. 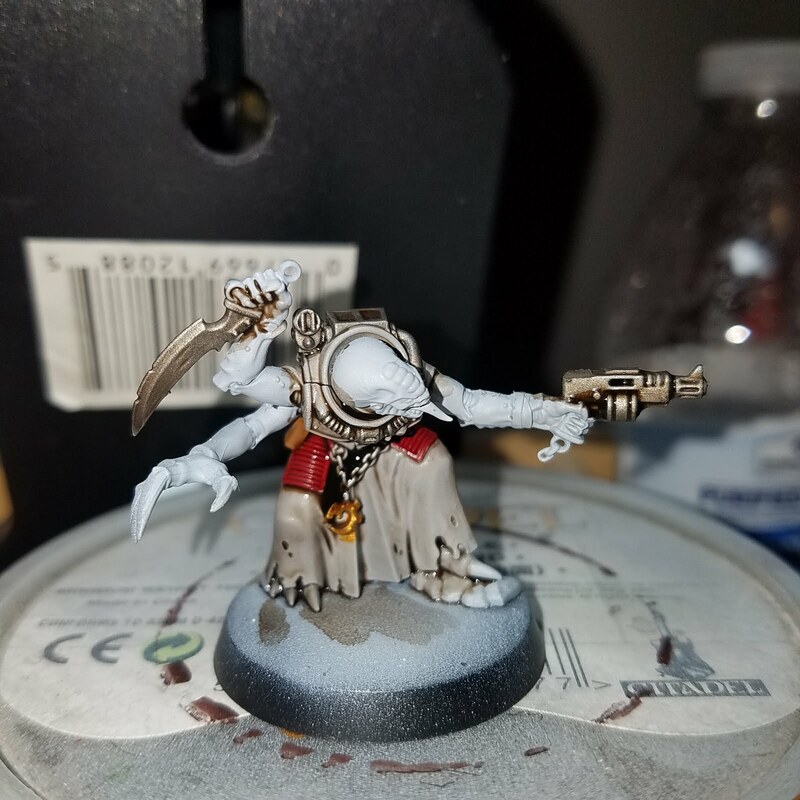 She liked the baroque styling to the Rubirc Marines, so I started working up a War Cabal for her. First step - prime them black, and then apply GW Retributor Armor to the whole model. 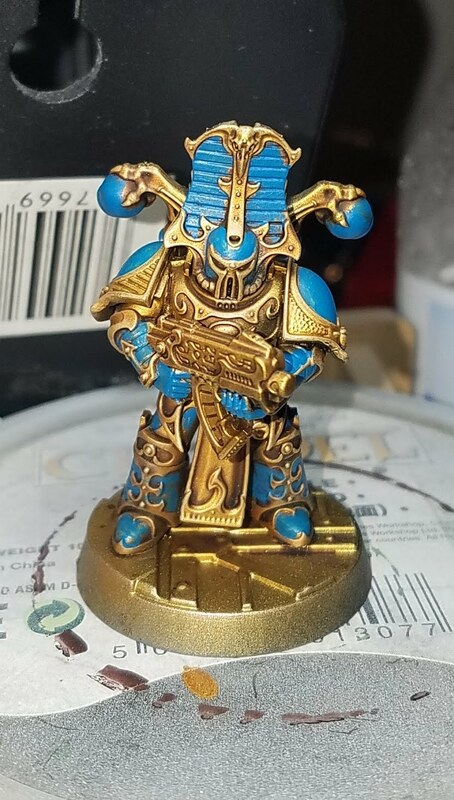 It will be easier to fill in the blue compared to painting in the gold. 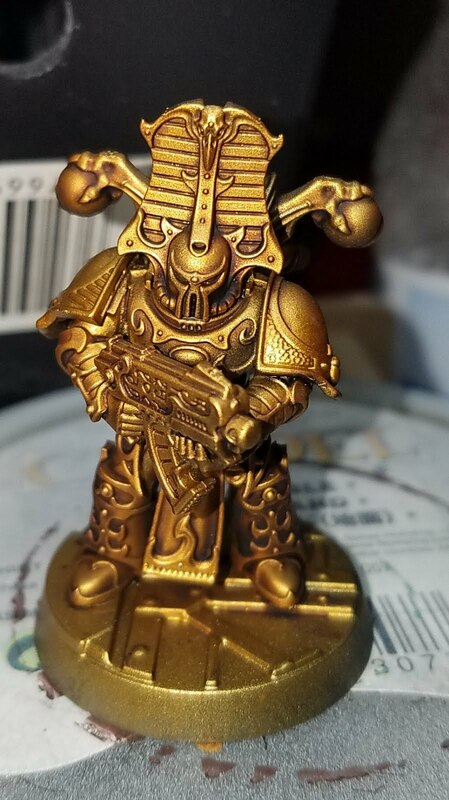 After this, apply a wash of Agrax Earthshade to the whole model. Watch for pooling! 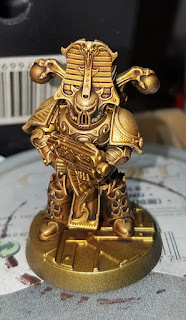 Instead of laying the gold, I decided to use drybrushing to get the gold to look burnished, so I applied a very light drybrush of GW Liberator Gold to the model. 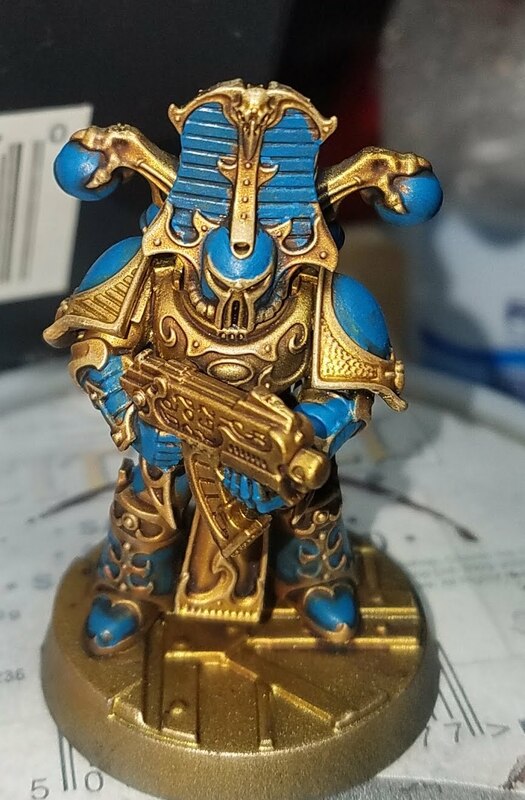 I then took GW Thousand Son Blue, and applied it to the areas of the armor I wanted to be blue. 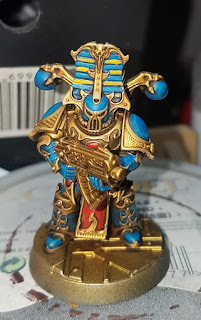 Over the blue I applied a wash of GW Nuln Oil, being careful not to get it onto the gold plating. Now, I applied another layer of GW Thousand Son Blue, leaving the darker areas in the recesses. Technically I could have pinwashed, but with the curls in the gold, that was going to be a pain. 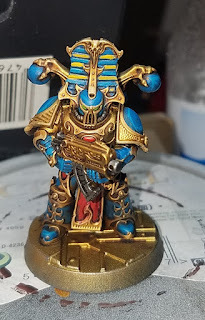 Using GW Ahriman Blue, I highlighted the blue areas of the armor. 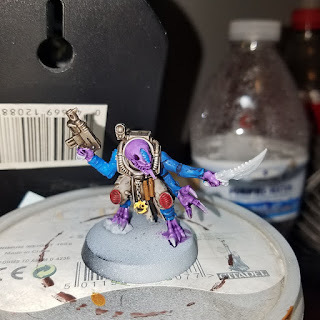 I also applied GW Averland Sunset to alternating areas of the helmet striping. I am only going to do this on the helmets. 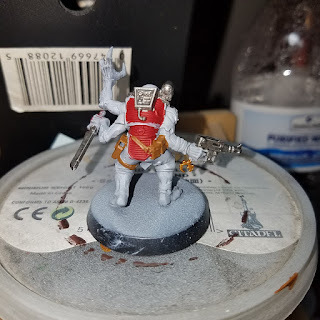 I applied GW Wild Rider red to the gem on the chest, and to the center part of the tabard, followed by a light wash of Carrowburg Crimson over that.. 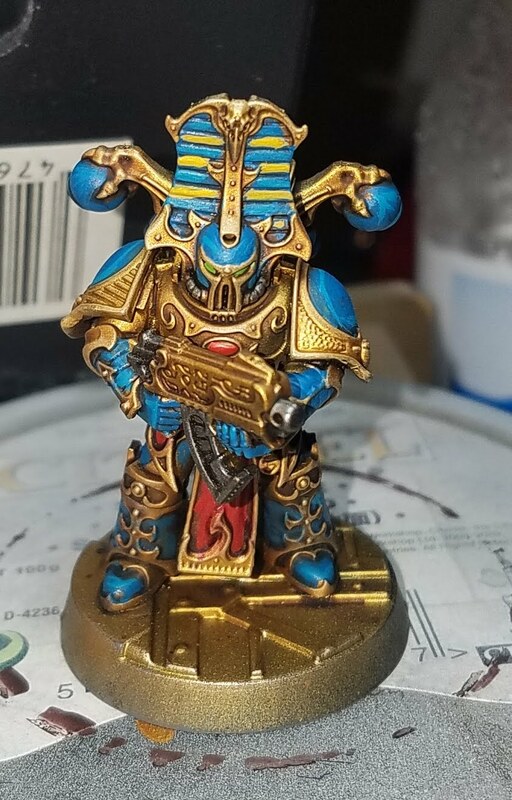 Using GW Yriel Yellow, I lightened the yellow a bit further. I applied GW White Scar to the eyes, and washed this with GW BielTan Green. I re-highlighted the tabard with GW Wild Rider Red, and then applied a final highlight of GW Trollslayer Orange. 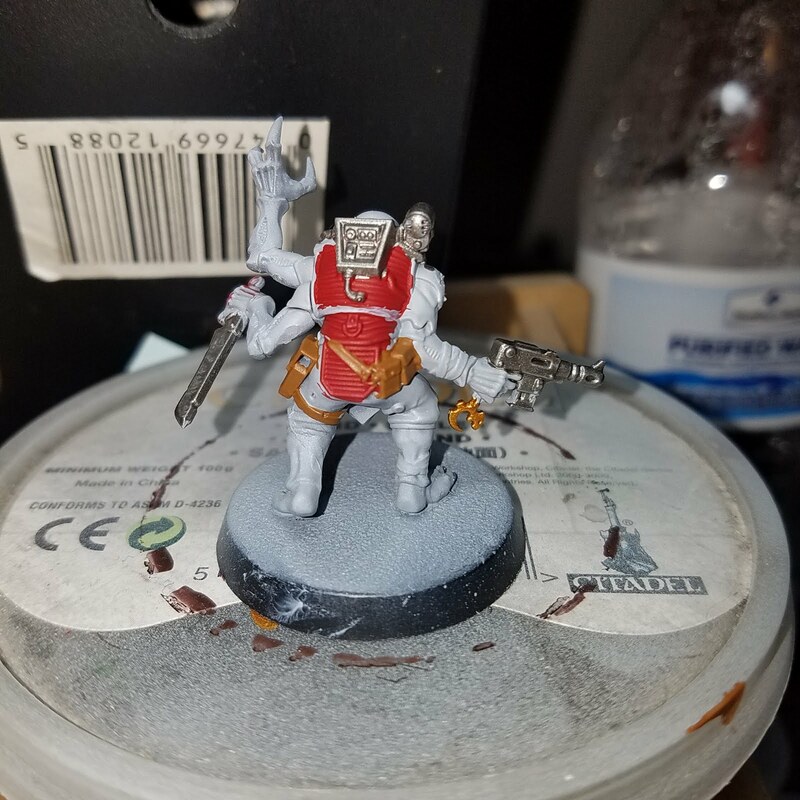 Worky bits on the bolter were given a base of GW Leadbelcher, followed with a wash of GW Nuln Oil. I did end up having to go back and clean up the lines between the helmet banding and did this with super thinned out black paint. Overall, the wife is happy with them, and so am I. No go and call forth the animatons! 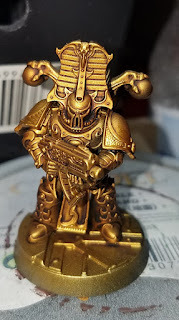 Okay, a lot of folks have asked about building up highlights, using just paint, no washes. 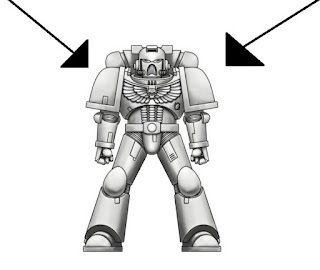 So I am going to use a spare Space Marine. 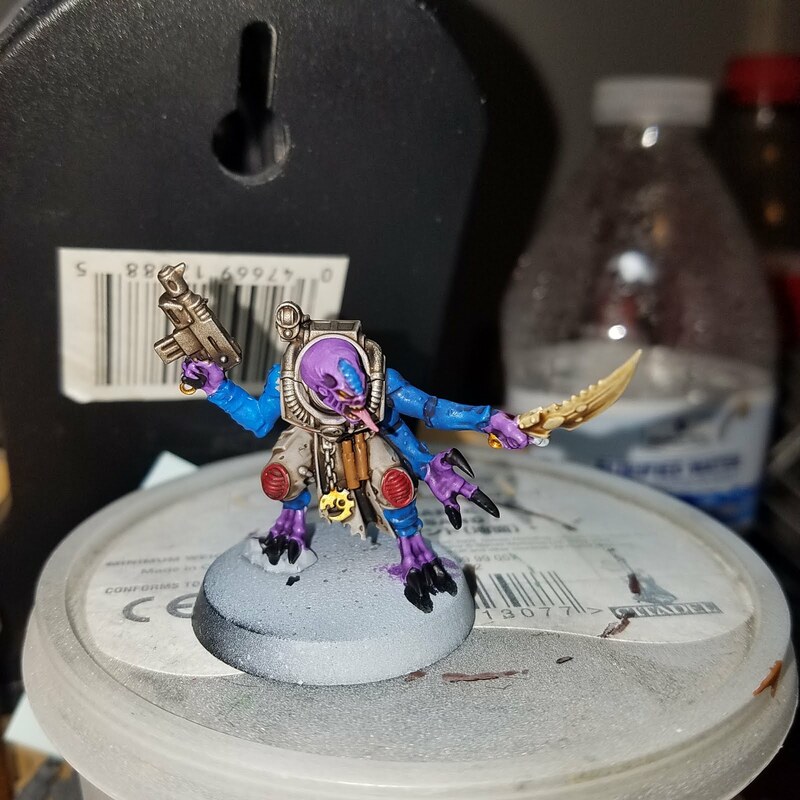 I have him primed blue, but I would normally prime him black. Okay, First, before we start, we need to talk about light sources. Now, there are a couple of techniques that we can use. All around, 360degree, coming in at a 45 degree angle. Object Source Lighting. For the most part, I use the 360 degree technique. 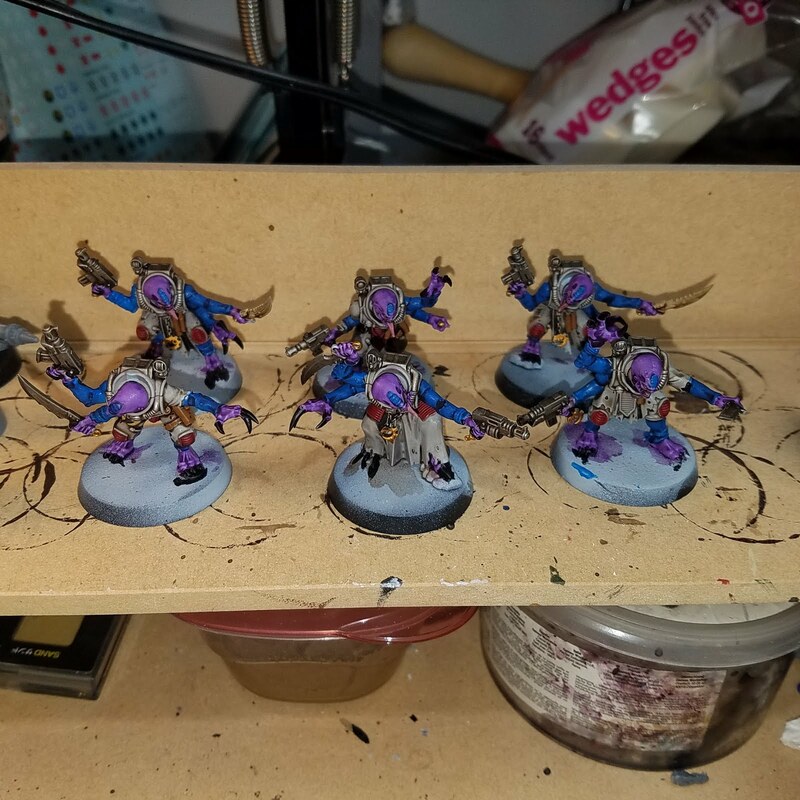 OSL is awesome, if it is done right. Kind of like this. Remember, we have it coming in from the front and rear of the model as well. For this tutorial, I am going to use a blue primed marine I have laying around. 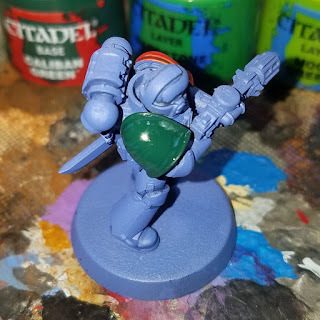 I did a paint up on the other shoulder pad, but didn't like the way it came out, so I went to the other side and started working in greens. 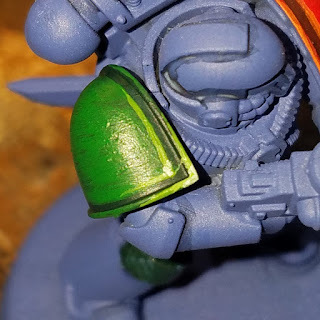 As the base, I laid down 2 thin coats of GW Caliban Green. Using GW Warpstone Glow, I painted the trim ring and the inside of the pad. 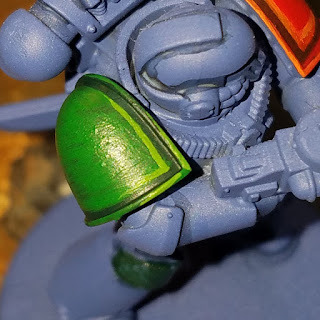 I left a thin line of the darker green to work as the shade. Again, 2 thin coats. With GW Moot Green, I applied a line to the inside of the pad, right up against the darker green shade line. 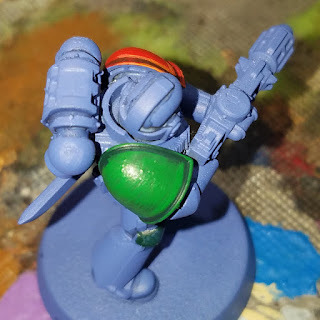 On the trim, so started the highlight a bit lower, to represent light shining off of it. Final highlight was a mix of 50/50 Moot Green with Skull White, and applied it to the very tip of the corners of the 2 highlights. Up close, the highlights might look a little chunky. But from a distance, the highlight does what it is supposed to - grab your attention and pull it to the hightlight. The Splash and Dash - using washes to get a quick finished model. Highlight to white. 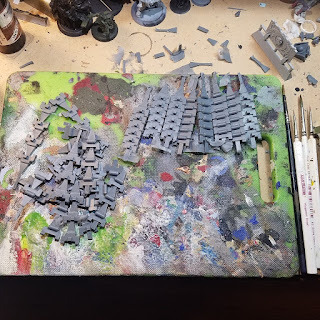 This was the old day GW painting mantra. Forget that. 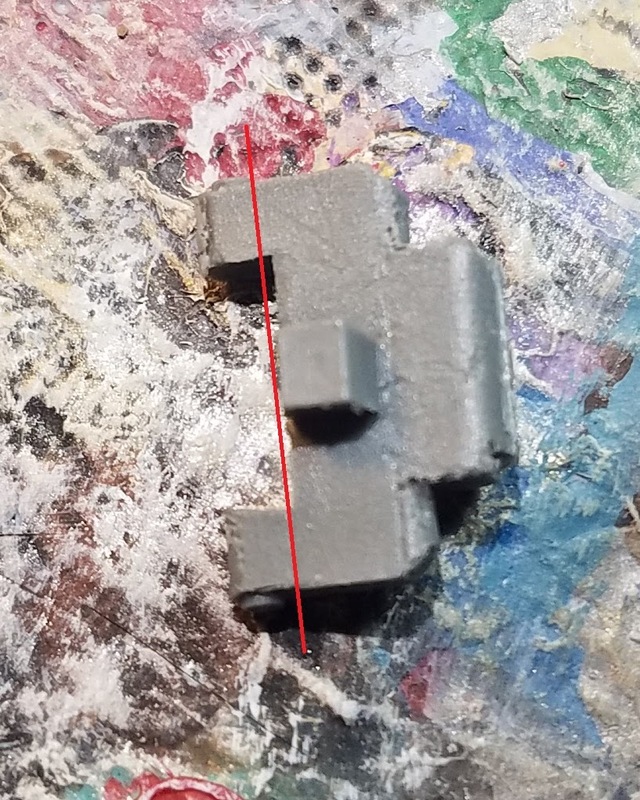 Most of us just want to get our models painting to a good table top standard. About 10 years ago, GW released it's first batch of premixed washes. Gone were the days of mixing 1 part Future Floor Wax to 9 parts water, and then mixing 1 to 4 of that with an ink to create a wash that would settle correctly. 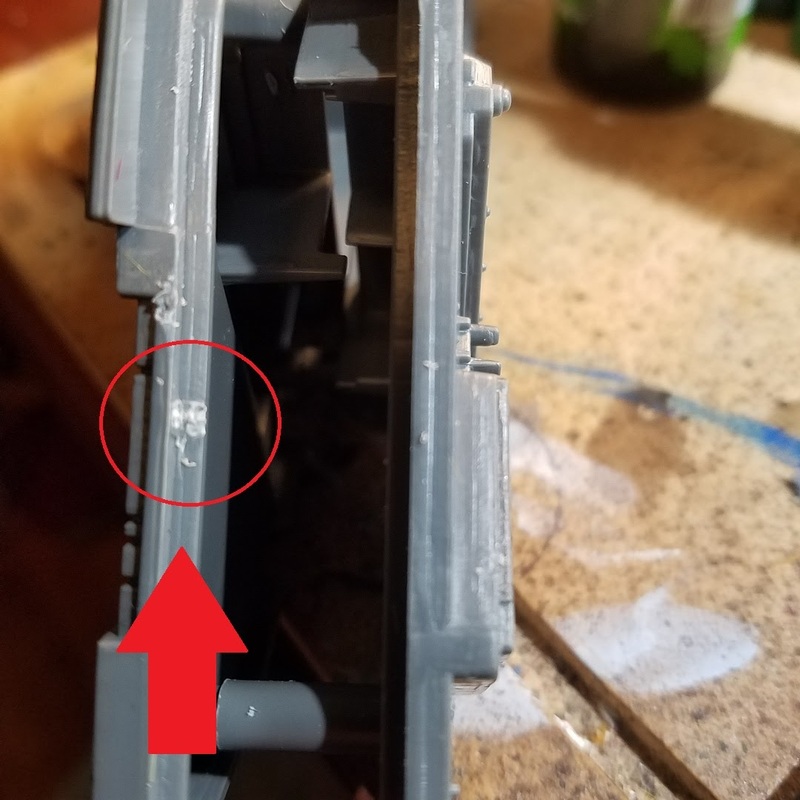 Since then, there have been other techniques that were similar - Dipping models in Minwax Polyeurethane wood stain, then Army Painters dipping process. 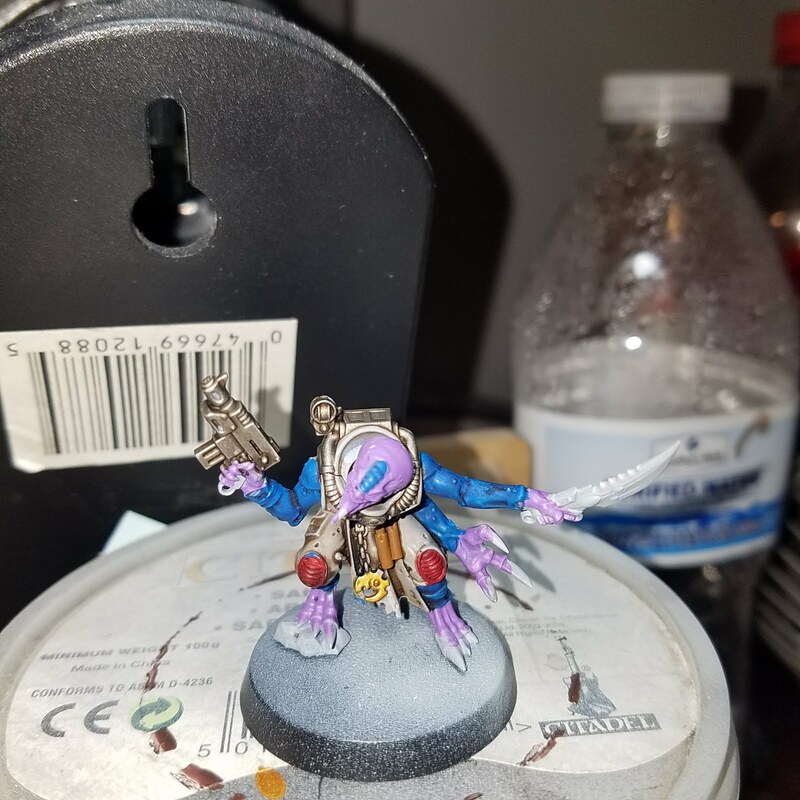 However, this was intended to give an overall wash to the model, and once on there, it was a pain to bump that paint level. 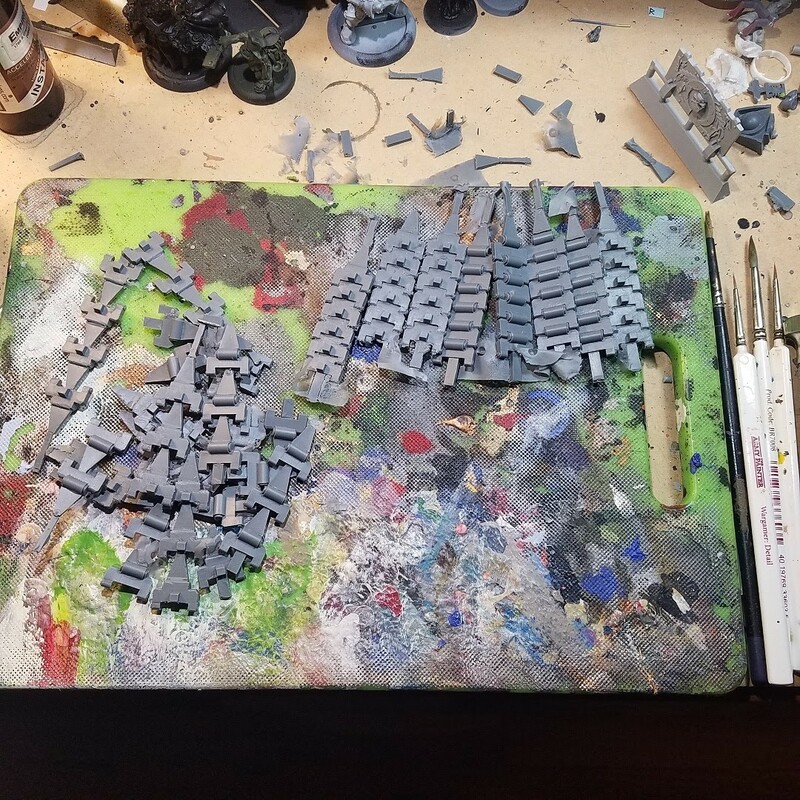 I like to use GW washes for a very basic tabletop level. It instantly shades the model, adding depth, and still leaves it where I can go back later and add highlights. So, working with washes. In traditional painting techniques, it is always suggested to start from the inside, working out. 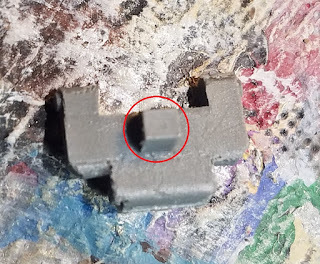 However, with the Splash and Dash method, utilizing block painting, I do a more controlled wash. So we have to start with the large areas first. Okay, so for this model, I primed the model in Vallejo USN Light Ghost Grey. 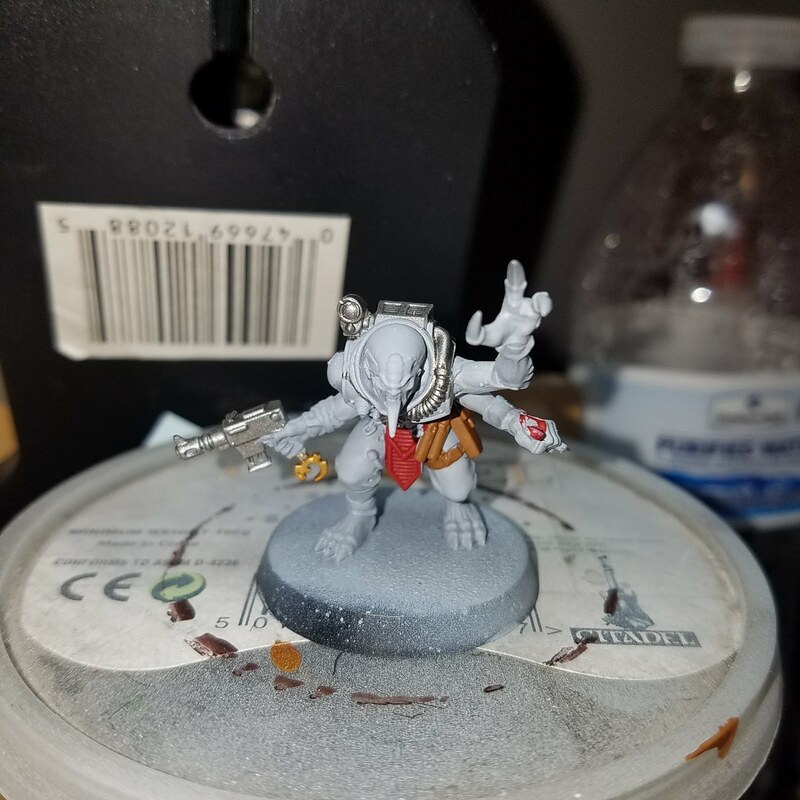 I wanted a light undercoat, and the majority of the model will be grey. I applied all colors in blocks, starting with the GW Mephiston Red, then GW Leadbelcher, then VGC Beasty Brown. After this, I cleaned everything up. Over this, I applied GW Argrax Earthshade. If you see on the model, there is a deep pool of the brown. Be sure to take a moist brush and pull this off. These pooling spots can take a long time to dry, and can leave a real patch to the model. Some pooling is going to be okay, but you don't want anything big. Once the Earthshade is dry, I took PP Cygnar Blue Highligh, and blocked out the arms, and armor plate on the head. After this dried, I washed this with GW Drakenhoff Nightshade. 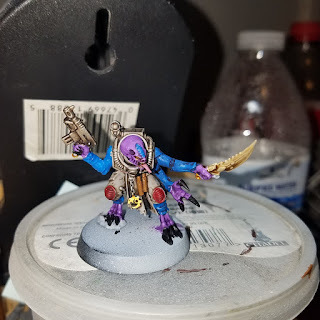 Once dry, I applied GW Genestealer Purple. Neatness is key here. You do not want to wash over the areas hit with the Argrax. Cleanup on that would be a nightmare. Once that was dry, I applied a wash over the purple with GW Druchii Violet. 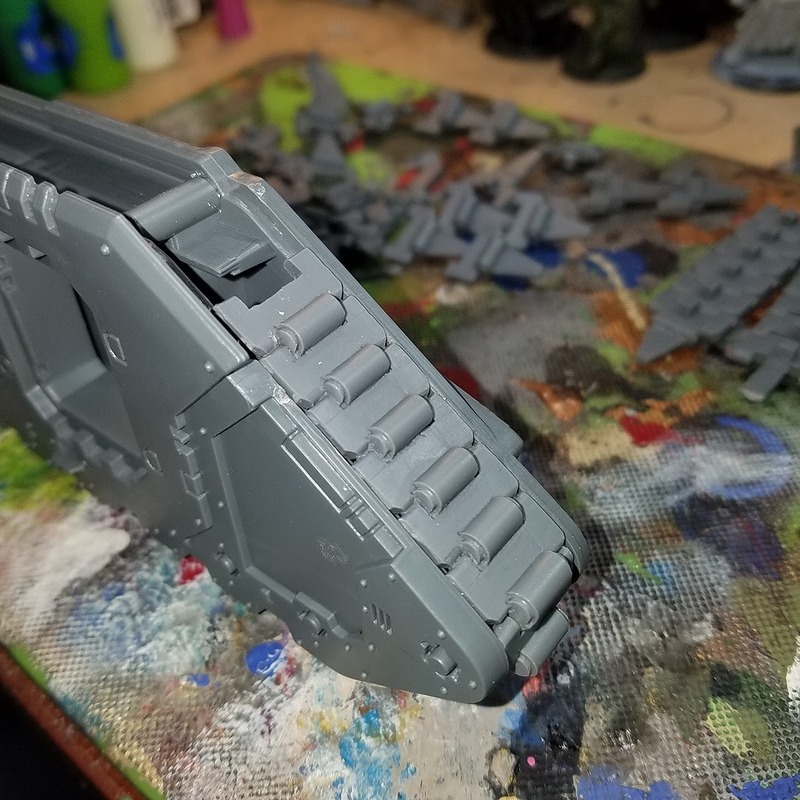 Let that dry, and then go and pick out small details, applying targeted wash as needed. And the block and washes are done. 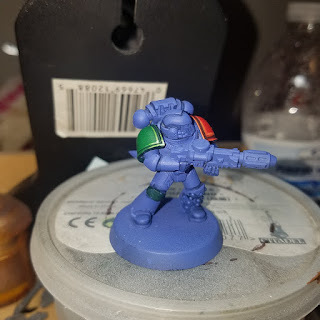 If you wanted to take the model a bit higher, take the base colors and apply edge highlights as needed.